My first ever pet as a child was a goldfish. I got him when I was 5. At first, I was super excited to be the owner of a new pet. But as a restless child, the thrill didn’t last long – the goldfish didn’t really “do” anything, and since we didn’t have a large tank with a fancy filter, it didn’t live very long. The folks at robotics company Hexbug have an interesting alternative to real fish ownership for kids – why not buy a robot fish instead? 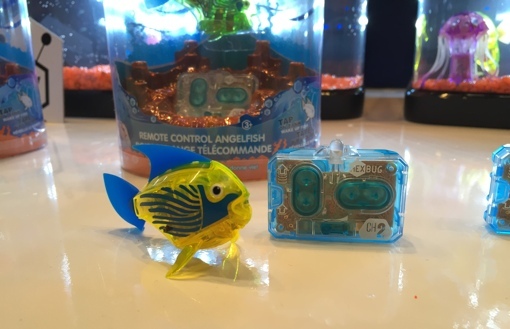 Unveiled at Toy Fair 2015 in New York, the Hexbug Aquabot Remote Control Angelfish is a fun high-tech pet that saves you the mess and expense of maintaining a real aquarium and the heartbreak of toilet bowl funerals. When kids drop their Angelfish in the aquarium (or bathtub), it immediately begins to explore its surroundings in 9 life-like swimming patterns. When it’s time for the real fun to begin, kids can grab the included remote and pilot the fish themselves. After five minutes of inactivity, the fish will automatically go to sleep to preserve its two button cell batteries (included). But don’t worry – kids can quickly wake it up by tapping the side of the aquarium or running their fingers through the water. The remote supports up to two different fish, so your kids can build your own robotic menagerie. Hexbug Aquabot Remote Control Angelfish come in four different colors and are recommended for kids aged 4 and up. The fish have an MSRP of $19.99. And if you want to build your aquarium even further, a self-piloting robotic Aquabot Jellyfish ($14.99) is also available in five translucent colors.